The lava fields at Craters of the Moon National Monument and Preserve in central Idaho are evidence of rift volcanism, where basalt eruptions over the past 15,000 years have created a moon-like landscape. 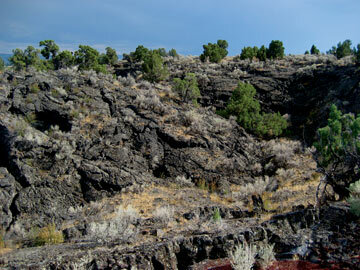 Much of Idaho, eastern Oregon and Wyoming are covered in lava flows like this one. In 2005, Yellowstone erupted into public awareness in the made-for-TV movie Supervolcano, reminding its viewers that America’s first national park is actually a sleeping volcano. Suddenly, the public and the media grew interested in what scientists already knew was a fascinating geologic feature. Beneath Yellowstone, and driving many of its beloved features such as the geyser Old Faithful, lies a churning chamber of magma that has erupted before and may erupt again. The park, an active “supervolcano,” is the site of some of Earth’s largest volcanic eruptions, and as such, presents a significant potential hazard to humankind. It is no surprise, then, that scientists are eager to uncover clues about Yellowstone’s past that could aid in predicting the volcano’s future behavior. If an eruption on par with the largest ever at Yellowstone occurred today, it would produce ash flows up to 600 meters deep in the immediate vicinity of the volcanic vent. This is enough material to bury the world's tallest building. Ash would coat the western half of North America and would be approximately a third of a meter deep for a 300-kilometer radius. Winds would carry sulfur aerosols and light ash particles around the planet, significantly decreasing global temperatures and devastating agriculture, water and air quality, and air traffic. It is important to note, however, that there are no indications that this disturbing scenario will occur within our lifetimes. Nonetheless, it is an important potential hazard for geoscientists to research, and what better way to predict Yellowstone’s future than to probe its past? Over the past 2.1 million years, the Yellowstone Plateau has been home to three super-eruptions and is just one of many volcanic fields of “supervolcanic” caliber in the western United States. In fact, a longstanding ancestral line of supervolcanoes precedes it. More than 200 explosive eruptive events spanning the past 16 million years, as identified by geoscientist Barbara Nash of the University of Utah in Salt Lake City, have created the Snake River Plain, a sequence of volcanic fields that begins in eastern Oregon, winds across Idaho and terminates at the currently active Yellowstone volcano in Wyoming. The volcanic fields are composed of rocks with higher silica content than basalt, and are of the type often associated with the world’s more violent eruptions. Yet many of these silicic fields are now overlain by kilometer-thick basalts, remnants from more iron-rich basaltic intrusions of the mantle plume beneath Yellowstone that melted overlying continental crust and generated the large “super” silicic magma chambers that are presently below the park. Heise, Yellowstone’s immediate ancestor, is a well-preserved volcanic field in eastern Idaho that has been geologically characterized by Lisa Morgan, a geologist at the U.S. Geological Survey (USGS) in Denver, Colo. By studying the isotopic signature of individual crystals in its rocks, Ilya Bindeman, a geochemist at the University of Oregon in Eugene, and I have found striking parallels between Heise and the younger Yellowstone Plateau field that indicate that “cannibalization,” or remelting of previously erupted volcanic rocks by basalt from the mantle plume, plays a key role in creating magma at each volcanic center. Cannibalization adds a new and important paradigm to recent volcanism in the Snake River Plain, as it results in frequent, systematic and volumetrically significant eruptions. Volcanic cannibalization can be used as a framework to interpret past events and possibly predict future behavior of the presently active Yellowstone volcano. The three massive explosive eruptions that occurred at Yellowstone over the past 2.1 million years had a recurrence interval of about 600,000 to 800,000 years. However, we have evidence of much more frequent eruptions of rhyolite — an extrusive silicic igneous rock — both before and after these explosive events. By pinpointing how and when these events occur, we may learn more about the accretion and emptying of the larger magma chambers and the eruptive cycles of small and large eruptions in the Snake River Plain. 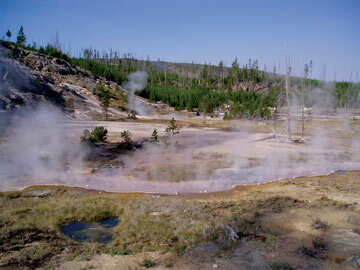 Geysers and other hydrothermal activity at Yellowstone are reminders that the park is volcanically active. Oxygen isotope signatures of individual crystals within volcanic rocks can help fingerprint the different magma sources. Oxygen atoms possess eight protons in their nucleus, but they may have eight, nine or 10 neutrons, yielding three possible oxygen isotopes: oxygen-16, oxygen-17 and oxygen-18. Magma formed from melting of the mantle or continental crust contains more oxygen-18 than shallow magma formed from melting of hydrothermally altered crust. Originally, scientists thought that Yellowstone magmas were solely derived from continental crust and mantle material with heavier oxygen isotope signatures. But in the 1970s and 1980s, scientists such as the late Irving Friedman, a long-time geochemist at USGS, and volcanologist Wes Hildreth of USGS discovered that many volcanic fields of the Snake River Plain, including the Yellowstone Plateau, contain magmas conspicuously low in the heavy oxygen-18 isotopes, giving the magmas so-called “light” signatures. Light magmas, though generally associated with comparatively small, benign eruptions, have erupted with supervolcanic fury in the Snake River Plain. The largest-known light magma unit in the world, the Kilgore Tuff (1,800 cubic kilometers), erupted explosively in the Heise volcanic field about 4.45 million years ago. If a Kilgore-scale eruption were to occur today, it would bury the immediate vicinity in more than 120 meters of ash, and other cities within close proximity, such as Jackson Hole, Wyo., in up to three meters of ash. In addition to the potentially explosive and dangerous nature of light magmas, they are systematic markers of the final eruptions of individual supervolcanoes. This has particular relevance for the currently active Yellowstone volcano, as it is in its final stages of life, and we can use the appearance of light magmas to make predictions about its future eruptive potential. Oxygen-18-depleted magmas indicate that hydrothermally altered crust is a component in these volcanic eruptions. Though light magmas are an integral component of Snake River Plain volcanism, even after more than 30 years of research, the genesis of light magmas is not well-understood. Some researchers think that they come from an oxygen-18-depleted source, such as a large reservoir of light, hydrothermally altered continental crust below the Snake River Plain that yields light magma upon melting by the Yellowstone mantle plume. Conversely, other researchers think that light magma comes from an oxygen-18-depleting mechanism, such as repeated explosive eruptions that fracture shallow rocks, create large calderas and expose initially normal continental crust to hydrothermal alteration and remelting, thus producing light magmas. Determining the source and mechanism of this isotopic depletion is central to understanding the eruptive histories of Snake River Plain volcanic centers. The standard cycle of creating a caldera, or volcanic crater, involves pre-caldera volcanism, explosive caldera-forming eruptions, caldera collapse and effusive post-caldera eruptions. Within that cycle, caldera collapse is the turning point from “normal” to “light” magmas at both Heise and Yellowstone. We believe that this is due to an oxygen-18-depleting mechanism operating within the caldera cycles in these two volcanic fields. The presence of light and normal magmas within each caldera argues against a single oxygen-18-depleted source, in which case all magmas would be light. This presents the obvious question: How do caldera cycles influence the generation of isotopically light magmas? At Heise and Yellowstone, like at other caldera settings, magma erupts both explosively and effusively. Explosive eruptions in this region generate large caldera depressions, formed from the collapse of roof rocks above the emptied magma chamber. Effusive eruptions (slower-moving lava flows like Hawaii’s Kilauea) occur in frequent spurts following caldera collapse, oozing out along the perimeter and within the center of the depressed caldera. Heise’s explosive caldera-forming eruptions began 6.6 million years ago and lasted for more than 2 million years, sequentially producing four large-volume rhyolitic eruptions. The first three caldera-forming rhyolites — Blacktail Tuff, Walcott Tuff and Conant Creek Tuff — totaled at least 2,250 cubic kilometers of erupted magma, all possessing consistently normal oxygen isotope values. However, the final caldera-forming eruption — Kilgore Tuff — and all subsequent post-caldera rhyolites exhibit steep depletions from the normal values. This large columnar basalt flow in The Narrows at Yellowstone National Park overlays glacial sediments and was produced by mantle plume volcanism that poured out lava across the terrain about 1.3 million years ago. 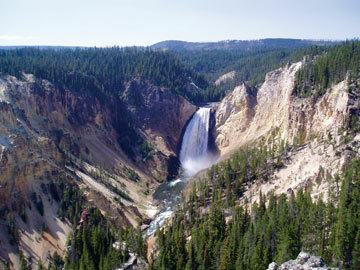 Similarly, oxygen isotope data from the presently active Yellowstone volcano reveal that throughout its 2.1-million-year history, three isotopically normal caldera-forming magmas erupted (totaling 2,500 cubic kilometers of magma): Huckleberry Ridge Tuff, Mesa Falls Tuff and Lava Creek Tuff. Caldera collapses from Yellowstone’s first (Huckleberry Ridge Tuff) and third (Lava Creek Tuff) caldera-forming eruptions are followed by sharp oxygen-18 depletions, as evidenced by a series of light post-caldera rhyolites. Like Heise, nearly all late-stage magmas of the Yellowstone Plateau are oxygen-18-depleted. Eruptions of “super” volumes of magma, and thus “super” caldera collapses, seem to be the common trigger for the appearance of isotopically depleted magmas in the Heise and Yellowstone Plateau volcanic fields. Determining why more than 2,000 cubic kilometers of erupted material seems to be necessary to trigger the formation of light magmas is not easy. The simple answer may be that larger volumes of ejected magma relate to larger caldera collapses, and thus the ensuing caldera is deeper and larger. This translates to a larger space for erupted volcanic material to accumulate in the caldera and a lowering of the caldera floor, bringing any accumulated volcanic material closer to the underlying heat source in Earth’s mantle. Hydrothermal systems have flourished in the Heise and Yellowstone volcanic centers for millions of years, as illustrated by geysers such as Old Faithful. Hydrothermal systems form when snow and rain water accumulate in pools and penetrate through fractures in the caldera, enabling the surface waters to circulate and become heated by hot, underlying magma. Snow and rain water are extremely “light,” and when in contact with “normal,” accumulated volcanic rocks within the depressed caldera, oxygen from the water mixes with oxygen from the rocks. This results in oxygen-18-lowered rock and oxygen-18-enriched water. Hydrothermal waters can only travel up to a few kilometers below the surface, at which point any empty spaces in the rock are sealed off due to pressure. Thus, the light oxygen isotope fingerprint enables us to identify a near-surface environment as the source for these light magmas. In addition to setting the stage for hydrothermal alteration, caldera collapse brings volcanic rocks that have accumulated within the caldera closer to hot, unerupted magma “mush” that coats the base of the freshly emptied magma chamber. Residual mushy magma ultimately crystallizes and develops fractures, allowing hot basaltic magmas from the Yellowstone plume to accumulate below the collapsed caldera and cause remelting of hydrothermally altered, isotopically light rocks within the caldera. As a result, oxygen-18-depleted magmas erupt as a new phase of light lavas at the surface and herald the final stages of basaltic magma burning into the continental crust, remelting and cannibalizing the uppermost crust. Evidence for the caldera cycle processes outlined above is found in some of the smallest and most adept survivors on Earth: zircon crystals. John Valley, a geochemist at the University of Wisconsin at Madison, has found zircon crystals up to 4.4 billion years old that have survived the most tumultuous, primordial stages of our planet. It is no surprise then that zircon crystals are extremely resistant to the intense heat, pressure and hydrothermal fluid flow characteristic of volcanic settings. These qualities allow zircons to retain important chemical information about their parental magma, such as their uranium-lead crystallization age and oxygen-18 isotopic compositions. Zircons extracted from Yellowstone’s extremely light post-caldera magmas often have oxygen-18 values that are much heavier than would be expected if the zircons had crystallized from oxygen-18-depleted magma. That indicates that these zircon crystals came from normal parental magma and the matrix and other crystals around them were subsequently “lightened” by snow and rain water. When the zircon-bearing rock remelted in the later parts of the caldera cycle, these zircon survivors were entrapped in a new oxygen-18-depleted magma. 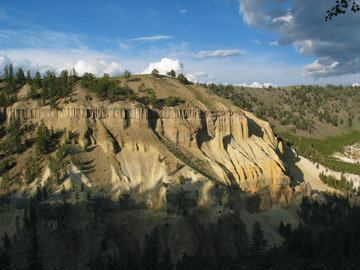 Visitors can see the results of lava flows and hydrothermal alteration in the Grand Canyon of Yellowstone. The Quaternary-aged rhyolite and tuff in the canyon contain a variety of different iron compounds, which have been chemically altered by hydrothermal activity and exposure to the elements, leaving the canyon walls streaked in various colors. Uranium-lead radiometric dating provides a particularly powerful investigative approach to trace the lineage of entrapped zircons. In 2001, Bindeman and Valley discovered that zircons with a normal isotopic signature extracted from Yellowstone’s light magmas possess much older uranium-lead crystallization ages than the age of the magma from which they were extracted. They found that these disparate zircons date to specific volcanic predecessors — the Huckleberry Ridge Tuff and pre-Lava Creek Tuff magmas. Oxygen isotopic fingerprints of the zircon survivors also match those of the identified volcanic predecessors. Bindeman and Valley interpreted these results as zircon entrapment from volcanic cannibalization: Zircons originally crystallized within normal caldera-forming magmas, then erupted and became surface material in early calderas, and then were subject to hydrothermal alteration and remelting following caldera collapse, which they survived with their original chemical information intact. They were finally re-erupted within younger, lighter post-caldera magmas. Though a compelling argument, it was not known if the cannibalization process advocated by Bindeman and Valley was a fluke or an expected outcome in the Yellowstone Plateau. Thus, Bindeman and I looked to Yellowstone’s most recent ancestor, Heise, to assess their previous findings in the Yellowstone Plateau. Based on the conspicuously light oxygen isotopic signatures of the youngest Heise magmas, we knew that hydrothermally altered surface material was somehow involved in late stage magma formation. We suspected a similar cannibalization process, where large swaths of hydrothermally altered volcanic material were remelted to produce light magmas. However, the volume of these light Heise magmas, some greater than 1,800 cubic kilometers, boggled our minds: Is it possible to generate such large volumes of oxygen-18-depleted rhyolite by shallow remelting? Support for the proposed cannibalization process at Heise was harder to come by than at Yellowstone, possibly because most of the original zircons were entirely remelted during cannibalization. Nonetheless, zircon survivors were found in one of the most recent light post-caldera lavas at Heise. Working with Axel Schmitt, a geochemist from the National Ion Microprobe Facility at the University of California at Los Angeles, we identified zircons that correspond in age to the Kilgore Tuff, the last major caldera-forming eruption of Heise that is 500,000 years older than the age of the lava from which the zircons were extracted. Furthermore, the oxygen isotopic composition of the zircon survivors is nearly identical to that of the Kilgore Tuff, implying that this was indeed the suspected source material. The Heise and Yellowstone volcanic fields erupted volumes of individual light magmas that range from less than 10 cubic kilometers to more than 1,800 cubic kilometers, but the combined volume exceeds a staggering 2,500 to 3,000 cubic kilometers. Moreover, geoscientists such as Scott Boroughs, John Wolff and Peter Larson, all from Washington State University in Pullman, estimate that Yellowstone’s pre-Heise ancestral caldera complexes erupted at least 3,500 cubic kilometers of light magma. When considering these volumes, it is helpful to compare them to the devastating 1980 eruption of Mount St. Helens, which released one cubic kilometer of material. The potential for such eruptions to be of significant hazard to human populations is unmistakable. Kathryn Watts and colleagues analyzed zircon crystals to determine the sequence of eruptive events and search for inherited uranium-lead crystallization ages in Heise magmas. What we observe for Heise and Yellowstone is that at a given location, more than 2,000 cubic kilometers of normal magma must erupt before seeing the appearance of light magmas during the final caldera stages of volcanism. This evidence indicates that cannibalization is not a fluke, but a staple of caldera cycles in these two, and possibly older, Snake River Plain supervolcanoes. This is important because understanding the cause of eruptions, whether by “normal” or cannibalization processes, and how the cause of eruption relates to the eruptive sequences, is key to future prediction of the currently active Yellowstone supervolcano. More importantly, the appearance of light magmas at the end of the eruptive cycles at Heise and Yellowstone indicates that the remelting potential of the crustal block was exhausted. In the terminal stages, only shallow, hydrothermally altered and comparatively cold crustal material was available for remelting. At almost the same time, new normal oxygen-18 super-eruptions appeared at a new place northeast of Heise, in the direction opposite to the plate movement over the hotspot: the present-day Yellowstone volcano. This is because the Yellowstone mantle plume is a fixed, stationary feature and the overlying continental crust of the North American Plate is moving southwest over the stationary plume head, progressively exposing “normal” fertile continental crust to the northeast. According to the patterns observed at Heise and Yellowstone, it will take another 1 million to 2 million years, and a couple of caldera collapses, to pervasively alter and fingerprint the crust with isotopically light values, ultimately producing light magmas at a new location. Both Heise and Yellowstone produced three normal caldera-forming magmas and a series of light “cannibalized” post-caldera magmas. The final stage of volcanism in each volcanic field is marked by light magma eruptions. If Heise is any indication, this could mean that the Yellowstone drama has entered its final act, but the volcano could exit with a climactic “big bang.” We do not know if the fourth caldera-forming eruption of Yellowstone will be analogous to the fourth and final caldera-forming light magma of Heise (the Kilgore Tuff). Or alternatively — and more likely — is the Yellowstone supervolcano geologically dead? The appearance of light magmas indicates that the uppermost portion of the continental crust has been consumed, exhausting the melting potential of the crust above the mantle plume. In this case, it will be another 1 million to 2 million years before a new supervolcano is born to the northeast, and the Yellowstone Plateau volcanic field joins the ranks of its deceased ancestors in the Snake River Plain. 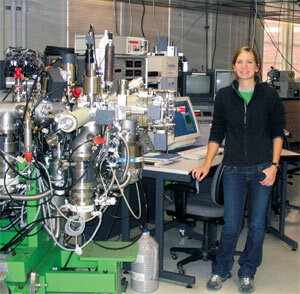 Watts is at the University of Oregon in Eugene, where she is pursuing her doctorate in stable isotope geochemistry. Her research focuses on large silicic igneous systems in the Snake River Plain. This work was in collaboration with Ilya Bindeman of the University of Oregon in Eugene, Axel Schmitt from the National Ion Microprobe Facility at the University of California at Los Angeles and Lisa Morgan from the U.S. Geological Survey in Denver, Colo.